MemberPay is a payment tokenization solution that allows Indian merchants to provide frequent customers with a faster, safer checkout process. With MemberPay, your customer’s credit card information is replaced by a substitute value called a “token” which is securely stored in our PCI Compliant servers. 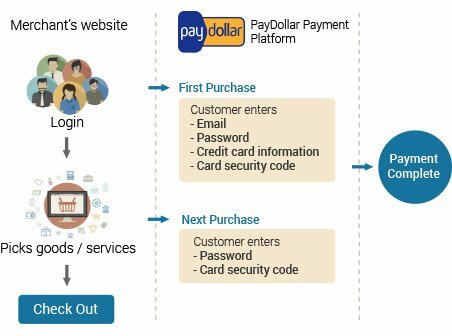 Customers are then given an account, a user name and a password, which they’ll use with their CVV for future transactions. Make repeat purchases easy and secure by enabling customers to complete payments without giving their card details. Each tokenized data doesn’t have any monetary value at all, blocking cybercriminals from gaining access to cardholder data. MemberPay lets you reduce the payment data footprint on your website, effectively lowering your PCI compliance scope. All credit card information is encrypted and saved in our Level 1 PCI compliant servers, ensuring maximum security. Segment buyers into multiple groups. Example: Group A – High Volume Shoppers, Group B – Low Volume Shoppers. Create multiple member accounts easily with a maximum of five (5) credit cards registered under each user. Reduce checkout friction with MemberPay.